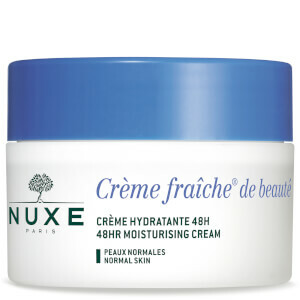 Treat your skin to the nourishing and protective properties of NUXE Crème Fraîche de Beauté Serum, a concentrated formula that delivers 48 hour moisture whilst shielding against urban pollution. Suitable for all skin types, including sensitive, the skin-quenching serum combines Vegetable Milks with Hyaluronic Acid to help soothe, moisturise and protect skin against the damaging effects of pollution. Ultra-fresh and moisturising, the serum will leave skin feeling replenished and comfortable; relieving feelings of discomfort whilst promoting a soft, fresh and radiant complexion. Apply morning and/or night to face and neck, under usual face cream. Aqua (Water), Glycerin, Lauroyl Lysine, Macadamia Integrifolia Seed Oil, Silica, Xylitylglucoside, Parfum (Fragrance), Squalane, Anhydroxylitol, Hydroxyethyl Acrylate/Sodium Acryloyldimethyl Taurate Copolymer, Phenoxyethanol, Xylitol, Ethylhexylglycerin, Tocopherol, Sodium Hyaluronate, Dehydroacetic Acid, Allantoin, Sodium Gluconate, Acrylates/C10-30 Alkyl Acrylate Crosspolymer, Posysorbate 60, Sorbitan Isostearate, Sodium Hydroxide, Helianthus Annus (Sunflower) Seed Oil, Sodium Carageenan, Sclerotium Gum, Glycine Soja (Soybean) Oil, Camellia Oleifera Seed Oil, Capryloyl Glycine, Citrus Aurantium Dulcis (Orange) Flower Extract, Prunus Amygdalus Dulcis (Sweet Almdon) Flower Extract, Cocos Nucifera (Coco) Oil, Glycine Soja (Soyeban) Seed Extract, Pisum Sativum (Pea) Extract, Disodium Edta, Avena Sativa (Oat) Kernel Extract, Maris Sal/Sea Salt, Camellia Sinensis Leaf Extract, Prunus Amygdalus Dulcis (Sweet Almond) Fruit Extract, Robinia Pseudoacacia Flower Extract, Cocos Nucifera (Coconut) Fruit Extract, Linalool, Geraniol, Limonene.